The billionaire bond-fund manager is known for his outspoken views, often using Twitter to express his opinions. In December, he described Deutsche Bank AG as a "sick puppy" and earlier this month he commented “Hmmm” after Netflix Inc., and incidentally his local breakfast place, raised prices for the first time in years. It’s not clear what suspicious activity Gundlach was referring to. DoubleLine and Gundlach didn’t immediately respond to requests for comment. 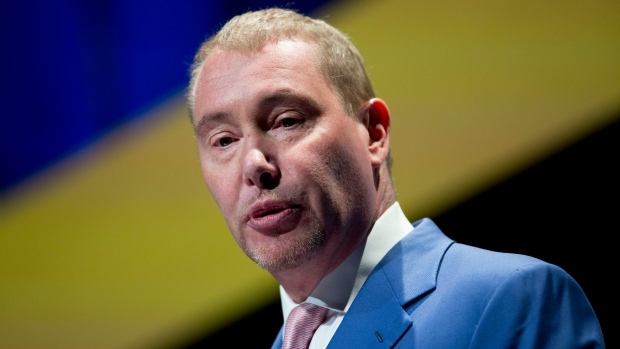 Gundlach has had a stormy relationship with much of the media. He said in a tweet in December he’d no longer appear on CNBC, blaming the decision on Jim Cramer, who hosts the network’s “Mad Money” program and had said the investor should “stick to bonds” after he made comments on the stock market. Gundlach isn’t the only high-profile executive to swear off social media. Media baron Rupert Murdoch, who first joined Twitter in December 2011 and used to be reasonably prolific, hasn’t been active since February 2017. Elon Musk also said he would stay off Twitter for a few days after his Tesla Inc. privatization comments, but has since returned. Gundlach is coming off another year during which his Total Return Bond Fund outperformed its fixed-income peers. It gained 1.8 percent in 2018, the best performance among the 10 largest actively managed U.S. bond funds, according to data compiled by Bloomberg. DoubleLine had an estimated US$121 billion in assets under management as of Dec. 31. --With assistance from Bei Hu, Jihye Lee and Sarah Jacob.